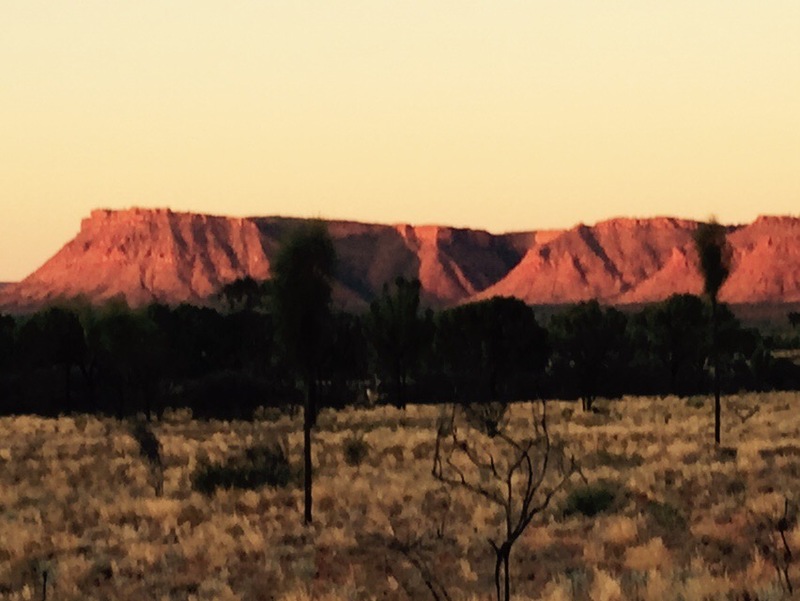 We had decided to get up to watch the sunrise (6.26 am) and then, as it is best to walk early before the sun gets too hot, to go straight off to walk around the base of Uluru, a walk of 10.5 kilometres. Sadly when the alarm went off it tranired Keith had not slept all night and did not feel he could do the walk. My immediate reaction was that I would not go either, but in the end I was persuaded to go with the girls and leave him to catch up on his sleep. We emerged into the almost darkness, but against the yellow glow beginning to appear on the horizon, the trees of our accommodation compound were starkly silhouetted. It was a sight to behold in itself. We set off, not realising that the sunrise area was some way away and in the end were hurtling along the road to get there in time. We arrived with about a minute to spare to join the assembled throng already gathered to watch the picture unfold. Families huddled together for warmth and the ardent photographic enthusuasists stood against the railings of the terraces, their tripods standing stiffly to attention, their expensive lenses trained on the large dark silhouette of the rock looming up in front of us. It must be remembered that we had the sun coming up behind us and as it rose the dark blue/black cherry colouring of Uluru turned to maroon and eventually a rich brown as the sky brightened around it and the suns rays penetrated its surface. And then it was over. The lenses were retracted and the tripod legs were snapped shut. People started to chat and move away and the sunset viewing terraces were left to their lonely solitude for another 24 hours. We, meanwhile, headed off for the Mala car park and the start of our circumnavigation of the rock. The Mala car park also marks the spot where the would be climbers of the mountain ascend. 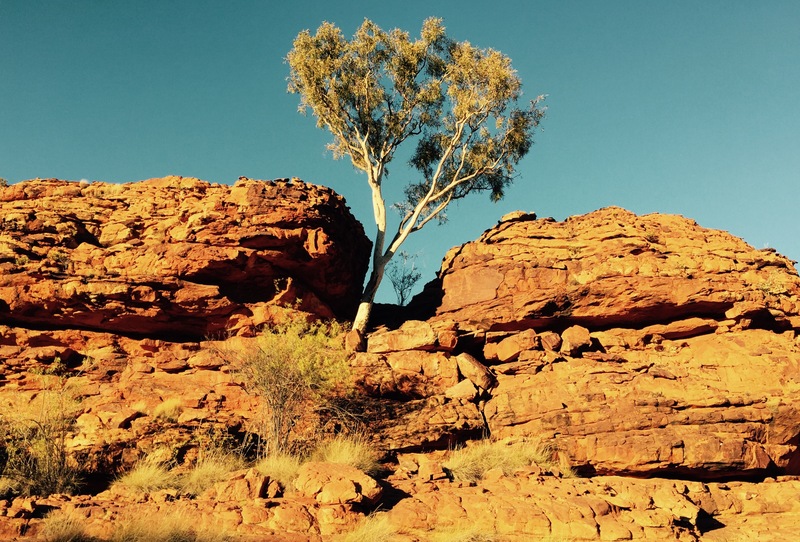 They do this despite the large number of notices requesting that people do not climb what is a very special place to the aboriginal people. However at 7.30 in the morning, no-one had arrived to ignore the sensitivity of the area and we almost had the place to ourselves as we crunched along the sandy path. It was still quite cold and the rising sun cast long shadows from the bushes and shrubs around the base of the rock. Close to, the rock itself is not totally smooth but has fissures and undulations, holes and crevices, overhangs and outcrops. It’s surface outside of these areas is quite smooth although it also has a slatey quality and looks a bit freckly for want a of a bette description. The route initially skirts the rock itself quite closely but it then turns away to the road which runs parallel to the path. Soon it turns back to the rock and apart from car parking areas, where coaches lurk while they wait for their passengers to return, you see no more traffic as you wander along. Every now and then there is a sign indicating a particularly sensitive area where no photography is allowed. Sadly, like the request that you do not climb the mountain, this is ignored by the many of our fellow tourists. I was very impressed with the safety precautions in place. Every few miles there was a shelter and emergency telephone and a map showing how far you had travelled around the circuit. Half way round there was a fresh water tank and tap. All geared.to ensure that you survive the experience – particularly if you walked it in the searing heat of summer I guess. As we continued around the sun rose further and the day became warmer. At the same time the rock itself changed from brown to golden in the bright light. The amount of trees and bushes ebbed and flowed to reflect the a mount of rain that ran off the top of the mountain when it rained. Dark channels marked where these waterfalls occurred It was fascinating. Birds chirped and called and although the number of people we came across increased gradually either on foot or bicycle nothing detracted from the spell of the place. We competed the walk in 2.5 hours and returned to our accommodation where we found Keith had caught up with some of his sleep and was ready for breakfast. This finished and after purchasing supplies for supper, we decided to head off to a place Kata Tjuta (the Olgas) which is about 35 kilometres from Uluru and is in fact higher. It is formed of a number of domes and can be seen on the horizon from Uluru. We walked part of the Valley of the Winds walk and looked back over the plain to see Uluru on the horizon. Kata Tjuta is also a special aboriginal site but seems less popular than the Uluru mountain, but to us I think it was equally impressive. When we returned to our base, Keith performed his usual magic with the food we had purchased earlier in the communal kitchen provided for backpackers. There were a number of nationalities represented in the kitchen – so the food being prepared was very cosmopolitan. Keith cooked Lebanese. And more from the station…. It was sad for us to say ‘good bye’ to our new found friends, but you could not help but feel that they were somewhat relieved to get rid of these ‘greenhorns’! However to us it had been a great and unforgettable experience. Packed up and ready to go, our departure was somewhat delayed by Rosie the house dog having run off with my shoe. This was eventually retrieved from her igloo bed……. Eventually, goodbyes having been said and addresses exchanged, we were off with me at the wheel, to drive to Uluru. We filled up again on the way, but were soon heading along the long straight, sun drenched highway. It was the weekend and there seemed to be more traffic on the road, but it was still the exception to see another vehicle. We must have left De Rose Hill at around 7.30 and we reached Uluru National Park circa lunchtime. 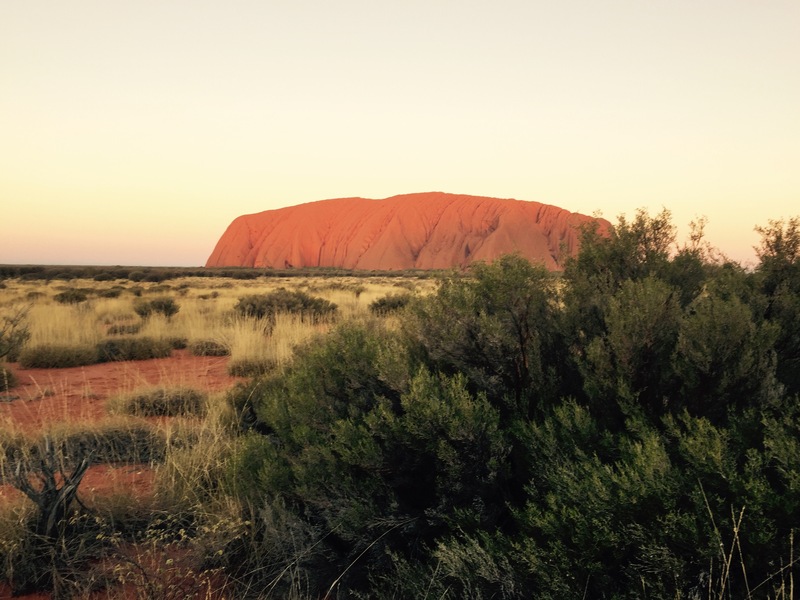 The Uluru rock came into view, bright red in the mid day sun many kilometres before we arrived at the National Park. I am not sure how I imagined it would be – my knowledge rather embarrassingly being of the dingo/baby tragedy of many years ago. However, in reality it is an awesome sight, seeming as it does from a distance, to rise as a hot red glowing rock standing four square in the middle of a flat outback plain. Up close it is very much more complex, with holes and gouges and runnels and bulges. Its surface is almost slate like. Indeed it is like no other rock I have ever seen. But more of this later. We paid for our three day pass at the National Park boundary. It was noticeable that although the area was handed back to the local aboriginal people some years ago, and is sublet by them back to the state, there are no aboriginal people working anywhere in the park that we could see. Everywhere is very organised and after lunch under one of the purpose built shelters, we visited the culture centre to get a feel for the place and learn something of its history. This was really useful but we decided to get the most out of the afternoon by taking a short walk along one of the tracks that run along close to the base of the rock. It was warm but not overpowering and we walked along with the awesome presence of the mountain very evident to our right. It was only a couple of kilometres each way, but it was very pleasant and got us into the place nicely and served as something of a taster for our time there. There are a number of walks around the mountain, the longest being the walk around the base which we decided was a ‘must do’ for the next day. The sad thing that we really picked up from the film we saw at the cultural cantre and the signs along the path was the lack of respect shown to the culture of the aboriginal people, for whom this is a very important site. Signs requested that certain areas were not photographed and that you did not climb the rock face. The fact that both requests went unheeded by many of the sightseers was very evident. We were somewhat dispirited by this but this apart enjoyed our first encounter with the mountain and its surroundings. The walked finished, we went back to find our accommodation. This was in a sizeable back packers centre close by. We all four shared a room, somewhat reminiscent of a prison cell, and a long way from our yurt experiences on the Silk Road when the four of us first shared sleeping accommodation! It was probably more Santiago pilgrim hostel! However it was very clean and was ideal for our needs. 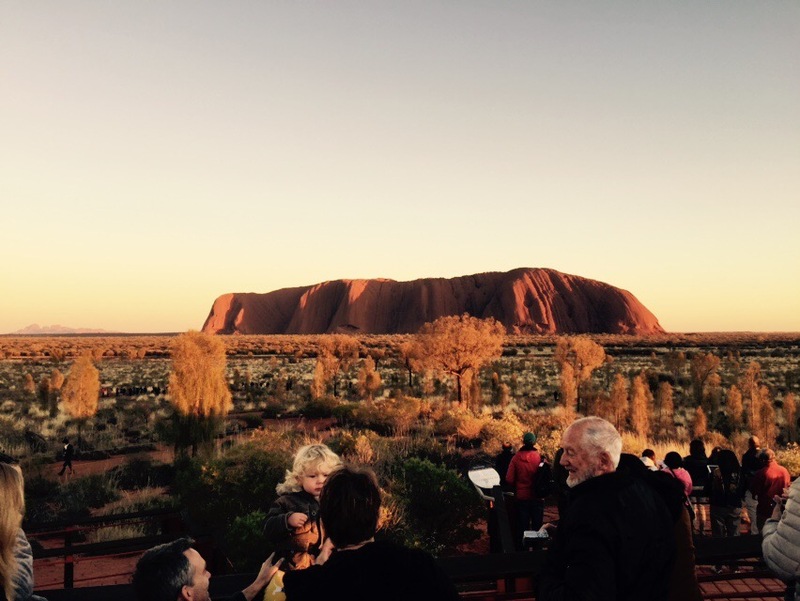 Around 6.00 pm everyone (including us) evacuated the area to watch the sun set over Uluru. We were not sure what this entailed but had passed a ‘sunset viewing point’ earlier in the day so headed there. We were first amazed by the numbers who had gathered and were then equally surprised to have the sun behind us! Watching the sun go down on Uluru means watching the colours change on it rather than the sun go down behind it. Of course. I have to say it was very impressive as it shaded from red to deep purple. It is a very special place. Once we had seen the demise of the sun for the day our thoughts turned to food. The accommodation might have been sparse but the facilities were very comprehensive and Keith and I opted for the self cooked burger approach to supper. It was excellent! I shared the lashings of salad with Sarah and, washed down with wine the girls had thoughtfully brought with them, we had an excellent repast. As it is better to walk early – it was an early night for us and 9.30 saw us all tucked up in bed. We mustered just after 7.00 am. It was a free range breakfast with John making coffee in a very fancy barrista style coffee making device, while tea was brewed, milk shakes, porridge and toast was made. Over the meal John allocated duties for the day. Keith, the girls and I were allocated to support (for this read hinder) John and Ann in herding some cattle to a holding area prior to them being assessed for the next week’s cattle auction. Before we get to our days activities, just a few words on the De Rose Hill Estate. John is a third generation cattle rancher. Ann and John own the De Rose Hill station which they bought 6 years ago. They previously lived at their other property, Lyndavale, which is twice the size of De Rose Hill and where their eldest son and his girlfriend live. There is a third station, Ebenezer, which John and Ann have recently purchased. 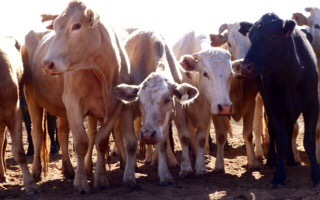 The De Rose Hill station is 7,400 square kilometres in size and they have 10,000 head of cattle. They have organic status and are justly proud of their reputation for prize beef, non aggressively farmed. They are 3 hours from the nearest town and have to be more or less self sufficient in terms of repairs etc. They have their own large petrol tank from which they supply their many vehicles with fuel. They work the station with very few people. Ben and Lily are there temporarily while they save to go travelling. Both Ben and Lily are qualified Civil Engineers. Ann has a Masters in Sustainable Land Management. Overall a very successful, charming, bright and capable family farming an unimaginably large tract of land. We were to learn that the Ghan railway line crosses their proprty and we will travel over it on the second half of our Ghan journey! To get back to our adventure. As we left to go to the yard, the working dogs were released from their pen and joined the troup heading towards the various ‘Utes’ (utility vehicles?!) the two retired dogs travelled in the back of Ann’s truck ‘for the ride’. Ben and Lily departed for their allocated task, Keith went with John, I went with Ann and the girls were given a ‘Ute’ to themselves, Wendy driving. When everyone had topped up wuth petrol at the pump, we were off over the sandy tracks of the station, the landscape covered wuth tufty grass – either the native spiky type or buffel grass a variety introduced for cattle grazing but now seen as a menace as it is highly inflamable and a great contributor to bush fires. 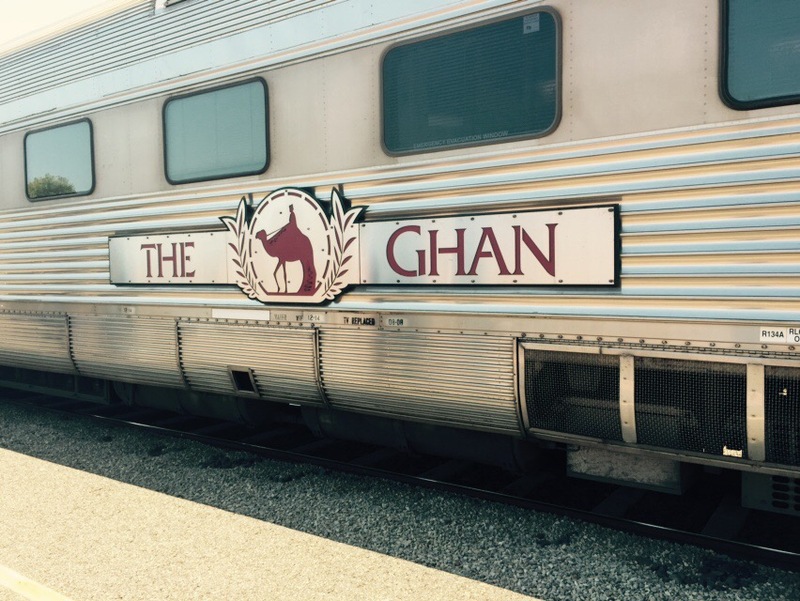 Before long we were crossing the Ghan track (as predicted!) and bumping along into the middle distance. As we went along Ann got out at intervals to check water troughs or fences. My job was to hop out every time we reached a gate, open it and then secure it behind us. We probably continued like this for about 3/4 of an hour before we arrived at a location where John and Keith had also stopped. We all got out. 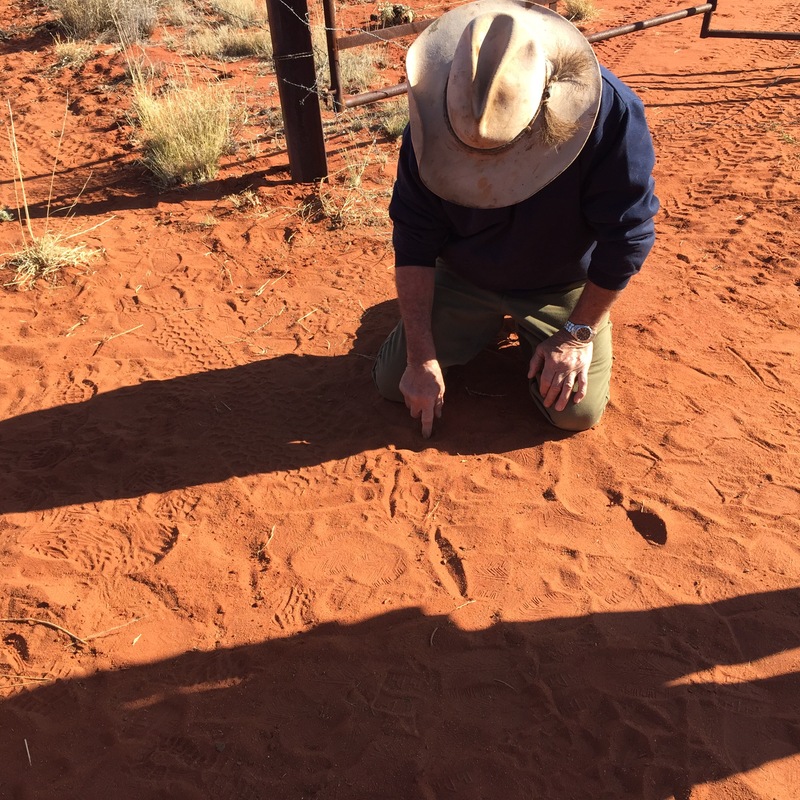 John was cutting back a barbed wire fence and when he had finished, drew in the sand what was required of the vehicles. Apparently we were going to come to a large group of cattle (how did he know in this vastness I thought?!). When we reached them – just where he said! – John would use his vehicle to lead them to the new location where he wanted them to be. Ann would guide them from the side and Wendy would gently urge them along from behind. It more ot less happened as John said it would except ‘herding’ them comprised of the vehicles Keith and I were in literally careering through the brush to keep the progress of the herd in check. It was amazingly skilled driving as we bumped and swerved over the terrain to head off a splinter group trying to break off and head in another direction. The ground is basically sand and quite stoney but as we saw from the train it is covered in brushwood, clumps of grass, small trees, the not infrequent boulder and more often than not sizeable trees! There are also sneaky gullies for the unwary! Although we accelerated, turned, swerved and breaked, apparently this approach is much less stressful to the cattle than helicopters! This is as it may be, but it is certainly adrenalin producing for the would be passenger! We probably spent the best part of the morning on this task, working away until the herd were where they needed to be to ensure they were included in the following week’s round up for market. 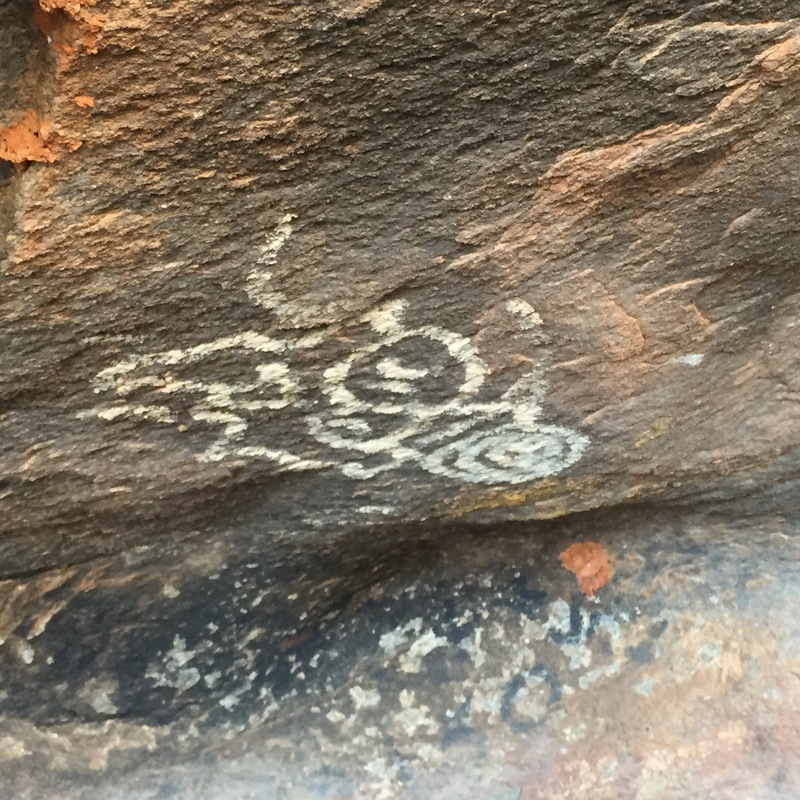 The girls and I were taken off by Ann to see some aboriginal paintings on the estate and to look for wallabies. Doesn’t everyone on Fridays? We found the paintings but there were no sign of the wallabies or any kangeroos, much to Ann’s disapointment. i have come to the coclusion there aren’t any as I have by now been in Australua for more than a week and have not seen one…… By this time I was driving the support Ute with Wendy as my passenger. This was much easier said than done, not least because I have got out of the habit of changing gear since young Duke arrived, but also because Ann careers along at an amazing speed. As Wendy said the dust cloud of her vehicle proved amazingly useful to keep tabs on where she went as keeping up was a real challenge. However, worse was to come as I failed to hit a gully at an appropriate speed to enable me to get across it and I sank the car in sand! I was mortified, particularly as it was by now after 12noon and Ann was wanting to get back to some buyers who were due at the station house at 12.30. Eeek! What a pain. Ann of course was miles ahead but as Wendy started digging us out, much to my chagrin, she backed along the track to our rescue. With great efficiency a large tow rope was produced, the towing points were identified and we were pulled out and were on our way again. How pathetic I am! 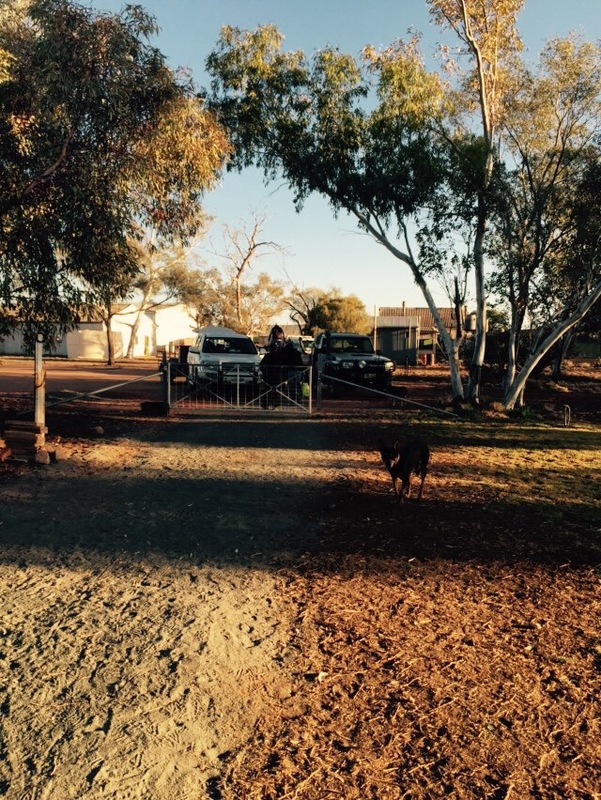 Another half an hour, a brief stop at an aboriginal water hole and we arrived back at the Station House. We ate wraps for lunch and after food and water we were all back out again. Ann had disappeared with the visitors but after a brief delay while Ben and John mended the breaks of their road train vehicle (!!) (they have their own three trailered road train lorry!) we set off to sort the stock to be sold. Once again we had to ask how they knew the cattle would be where they thought they would be, but there they were in an enclosure with a water hole. The fencing has a very clever gating device which allows the animals in but does not allow them to get out again. So there they were, perhaps 200 head of cattle all coralled together. Mums, babies, boys and girls – all were there making a bit of a din. 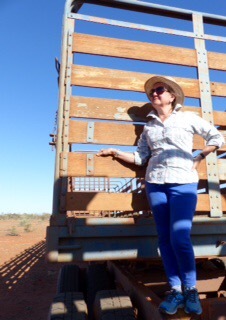 Soon the road train arrived and parked up beside a ramp that led from one of the fenced off paddocks. We then watched while John assessed by eye the weight of each animal and it was either identified as being marketable or to be held back for another day. All mums and babies were held back. It was fascinating. We stood for the whole afternoon watching the process as those chosen for slaughter were guided up the ramp on to the truck to be transported back to a pen near the house in readiness for the next stage of their journey to the abbattoir. It was all very efficient, calm, very ordered and stress free for the animals. We coud see where the station got its reputation for the way they treated their stock. It was well deserved. 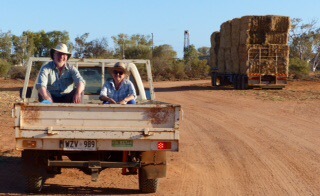 At the end of the afternoon we clamboured aboard the back of one of the Utes and careered home. 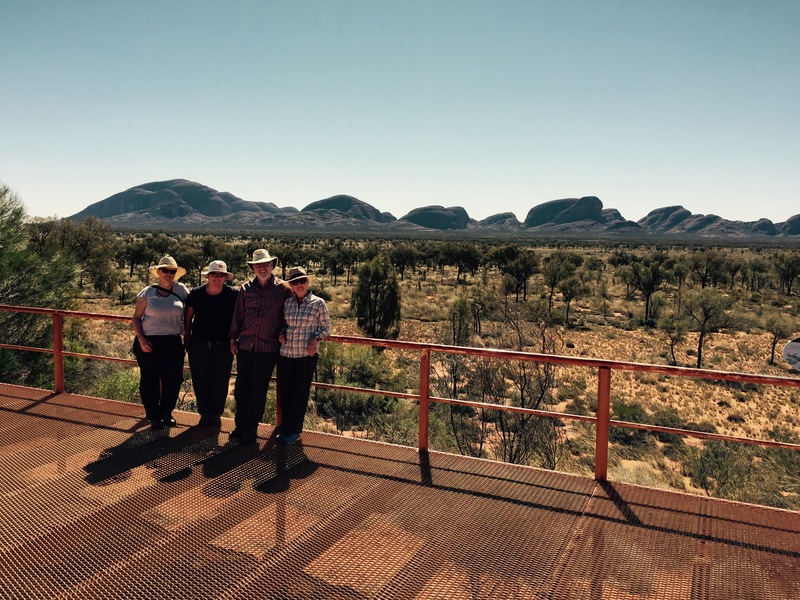 Four very privileged visitors who had been allowed a rare insight into the workings of a large cattle station and been treated with great tolerance and friendliness, despite our ability to add nothing but aggravation to the proceedings! We were absolutely covered in red sand. It took three baby wipes to remove it from my face and the shower ran red for a bit….. Eventually, changed and tidied, we gathered around the large dining table for a delicious salad and, for the meat eaters among us, the produce of the stations labours, amazing steaks. These were washed down with wonderful Australian red wine. The talk flowed equally freely around the table and a good time was had by all. A game of Australian football carried the chaps off fairly early, but us ladies gracefully and greatfully adjourned to bed. What a day! We were leaving the train at Alice so needed to get off at 9.00 am. We had been up really early to watch the sunrise (Martin, CA, had brought Keith a coffee at 6.00!) however, we were a bit slow to get to breakfast and, regrettably, were even slower to get served. In the event the train was pulling into Alice Springs as I finished my Eggs Benedict. It did not matter as there were various procedures that had to take place before the doors were opened. When they did – there was our good chum Helen Kilgariff! It was just great to see her. She has done so much to arrange the Alice Springs section of the trip and sadly is to miss it all as her daughter is having her first baby at 41 and, understandably, wants her Mum around for the birth, so H was off to leave for Melbourne later in the morning. However, for the moment she was with us and off we trekked to her ‘place’. We thought she lived in Alice but in fact it is 20k outside. We are beginning to get a handle on this distance issue! Her home is a large single story establishment set in 24 acres of ground. It is vast! However the size and beauty was somewhat overshadowed by being reunited with Wendy and Sarah, two more of our Silk Road party, who had travelled across from Sydney to accompany us for the week in Helen’s absence. We were to find that their offer to join us was not totally altruistic as they had not been to the centre of Australia before either, so we made a very excited party! All too soon Helen was leaving for the airport and after a quick lunch and downsize of bags into two smaller ones that Helen had thoughtfully provided, we bundled into Helen’s car for the 3.5 hour ride to the cattle station owned by Helen’s sister and her husband. The journey to De Rose gave us our first taste of the long miles of Tarmac that constitute the Australian road system. We flew along eating up the kilometres and stopping at every petrol station (you can see why you never pass one without topping up as you never know when the next one will be!) 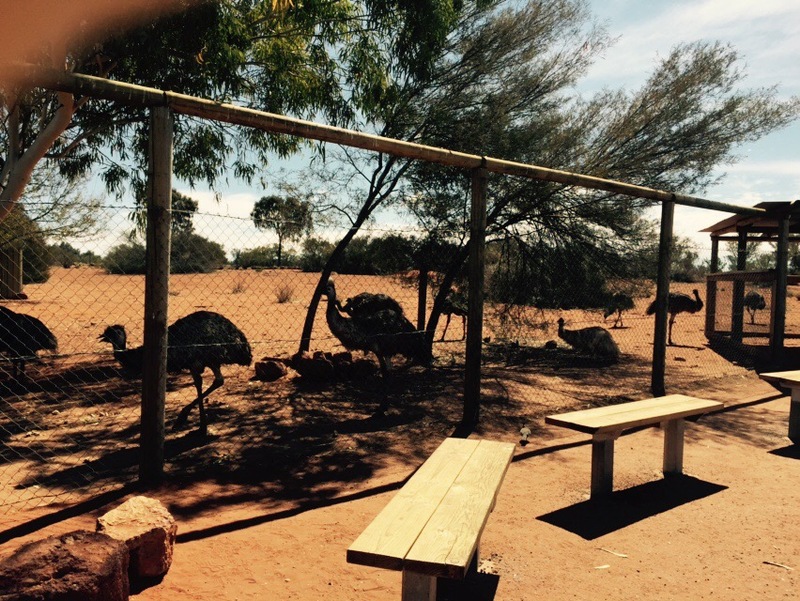 and then at another road house where we had been instructed by Helen to inspect the emu…….! We had been told that Ann and John were unlikely to be there when we arrived at they had been selling some stock that day. This proved to be the case but we drove into a vast yard of buildings and farming apparatus. On leaving the car we were met by two old Kelpie’s, who we were to discover were retired working dogs. Guard dogs they weren’t as they came towards us wagging their tails and wanting to be stroked. Nearer the house we met Rosie a very young and shiny Staffordshire terrier who was chained up but equally pleased to see us. We settled down to await our hosts to the increasingly wonderful smell of bread from the bread maker sitting on a shelf behind us and a casserole in a large slow cooker. We sat in a sort of large Dutch barn affair where a big table and chairs were set out. We broke open the beers and chatted happily until the clanking of a large three trailered road train appeared on the horizon and our hosts were home. About 10 minutes later Ann, John their son Ben and his girlfriend Lily appeared. They were amazingly friendly to four people they had never met who we could not but feel Helen had foisted upon them! Within no time it seemed, rooms had been allocated and we were sitting down at the big kitchen table tucking into the vat of food and bread and quaffing vast quantities of wine. 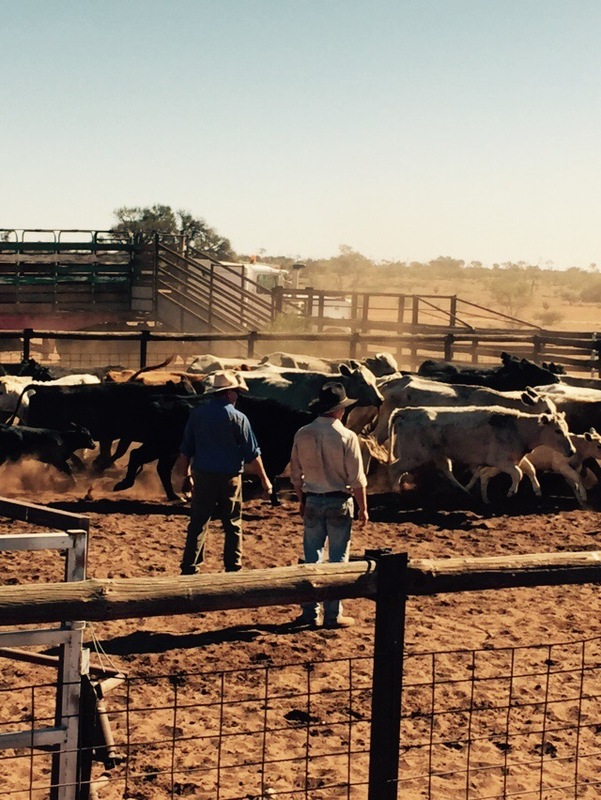 Our two nights on the cattle station had begun! ……….and so it was that there were no more sleeps and our departure day had arrived. We both described a mixture of of angst, anticipation and excitement that rendered us both a bit hyper with emotions a bit near the surface. A tardy chauffeur, a crash ahead of us on the M25 and stationary traffic added to the tension – but it was nothing a strong gin and tonic and two glasses of wine wouldn’t cure! And we were off! We took no time at all to settle into the rarefied surroundings of our upper deck – ducks and water came to mind – and very happily wined, dined, filmed and snoozed our way through the six hour flight to Dubai. Throughout Emirates staff silently glided along the the aisles (maybe due to the headphones that gave an ‘out of body’ experience’ feel to the whole affair) dispensing elegant largesse and bonhomie – truck Penelope eat your heart out!!! The second leg of the journey – Dubai/Brisbane – was not quite as serene but nevertheless the 12 hours passed and Brisbane appeared through the dawn blushed cabin windows after a rather fine breakfast of eggs benedict. How did they get perfect poached eggs at that height? We emerged from the airport to a beautiful but chilly day of 8 degrees and were whisked off on the short journey to our accommodation, reached by a three lane highway, 7 kilometres of which ran under a tunnel. First impressions were of a modern city built on a winding river with tall commercial buildings interspersed with lower industrial sites. The technical hitch, rather naively not anticipated, was the fact that we arrived at 7.00 am and our room was not available until 2.00 pm! We just had not thought about that as a possibility! A quick change of footware, having left our baggage for safekeeping, and we were walking by a glorious riverside – us and what seemed like the total population of Bribane out jogging or cycling. The energy and testosterone was palpable! It was all a bit ‘full on’ for a couple who had emerged from the laval state of an 18 hour flight. We were almost blinking against the light and were surrounded by a mass of moving humanity. Never had I been surrounded by so much acid coloured Lycra taughtly stretched over so many athletic limbs (and not athletic) so early in the morning in such a beautiful setting. The river sparkled to our left and cultural galleries and museums edged the tree lined route to our right. In between we were seriously impairing the progress of the young and not so young of Brisbane keeping fit!! We meandered along following the river as It twisted and turned back on itself. On the opposite bank, tall commercial buildings soared and the roadway along the waters edge ran precariously suspended over the river. It all felt very new, very modern and somehow go–head. We must have walked over a mile along the river when we decided to walk across a pedestrian bridge which gave us tremendous views over the water, to the other side. Here things were somewhat calmer and we took the riverside route through the botanical gardens. Our path took us past unknown trees with interesting seed pods and dangly bits and the air rang out with unidentifiable bird calls. Having turned away from the river and wandering deeper into the garden we came across ibis stalking around quite fearlessly, their long beaks jabbing into the earth, totally heedless of our passing. Other birds screeched overhead and the situation found Keith calling for his Australian bird book! We found a cafe in the middle of the gardens and had a jolly outdoor breakfast before heading into ‘centre vile’ to buy a local telephone with Australian connectivity. Our route took us out of the gardens and past large colonial buildings. 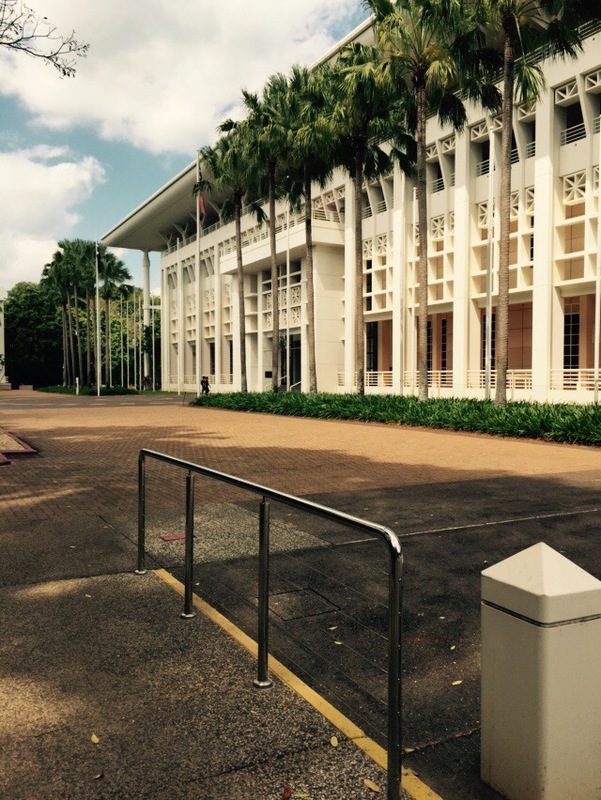 These markedly contrasted with the modern skyscrapers looming up behind them and led us from the old architecture through to the modern Queensland University of Technoliogy campass with its wide sundrenched walkways. Leaving this behind we walked into the central commercial area where the roads covered a strict grid pattern with queens names running North to South and kings names East to West………. Very effective! Having walked and peered down several there seemed to be no sign of any shops so we decided to give up and instead explore the restaurant area of Eagle Pier. This very up market area found us pondering over the different menus and disappointed to learn that the restaurant ‘Mr and Mrs G’s’ had a private function and we would not be able to eat there – which might have been fun! As the name implied, all the very attractive venues faced the river and the two steam paddle boats offered the opportunity of actually eating on it! Having identified this as the location for supper we wandered back into the royally named road matrix and eventually found the Queen Street Mall lined with a mix of designer shops, hotels and cafes. The Telstra phone was purchased and having become decidedly droopy despite another drink stop (it was by now nearly mid day) we decided to see if there was any chance of getting into our room before our knees buckled completely! Back across the river we went. By now the Lycra clad excercise fraternity had given way to families and friends. All seemed very up beat. Everyone we spoke to was friendly and our first impression of Australia was of a young and vibrant society swept up in its own vitality. We on the other hand were two very sleepy English people who were totally relieved and grateful when we were told our room was ready and we could collapse for a couple of hours in a very comfortable bed! Later somewhat refreshed, we had a wonderful fishy supper back at the Eagle Pier at the Jelly Fish restaurant. The Pier was teeming with Brisbane glitterati intent on having a great Saturday night out. We on the other hand were a somewhat subdued, but really enjoyed our meal and surroundings and wandered home tired but happy with our first day in the antipodes……..
Sleep came quickly and wakefulness equally quickly struck with a vengeance at about 3.00 am………! Sunday proved to be a very different day! We woke to another beautiful sunny day and had decided to go to the Queensland Show locally known as The Ekka. 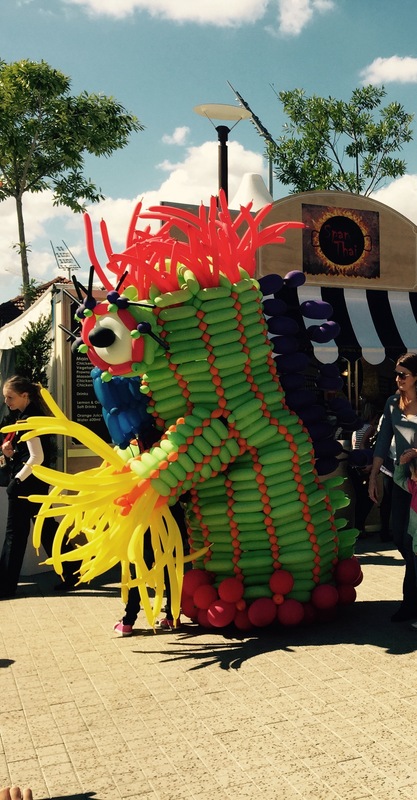 We were told it was an agricultural affair showing all the best of Brisbane and the surrounding area – something like the South of England or Kent County Show we thought. Perhaps buy some food for a light supper…… A way to find out more about Austalian life we thought………. We had found out where the buses went from – another experience — and we set off, Keith carrying an empty ruck sack in which to carry home any food booty obtained along the way. We arrived at the bus stop at the same time as the bus (a good start!) and piled on – the bus was full as we crossed the river. It became much more full as we travelled along. By the time we reached our destination we were like sardines! However everyone was in very good spirits as we spilled onto the pavement and entered the show ground to literally all the fun of the fair! Overhead enormous crane like arms swung bodies terrifyingly high in the air – all that could be seen were legs dangling – and cradles on wires hurled what looked like small specks of people around equally precariously skyward. Side stall holders hailed passers by to try to hook a plastic duck for a prize or take shots with darts or hoops. There were hot dogs and candy floss, Turkey drumsticks and lamb hocks, kebabs and hamburgers – it was 10.30 on a Sunday morning!! In one arena a wood sawing competition was taking place, with the participants being loudly encouraged by their supporters. This was an island of relative calm compared to the seething madness elsewhere! After initially feeling somewhat overwhelmed we found our feet and although still caught up with what seemed a tide of humanity, did eventually find the animals. The bird area where giant chickens peered out of their show cages, bright red combs awobble. Magnificently proud and strutting even if it was only a few paces. Enormous ducks, beaks snapping through their cage bars at unwary passers by. Huge cattle – some the size of small elephants! – but all incredibly healthy looking, filled the cattle shed. Sheep – some looking very much like goats to us – greyhounds, pigs. Hanging sides of beef, amazing vegetable displays. Large rosettes marked the champions and nearly champions …….. The agriculture was definitely a side show to the hot dog stalls and carousels. There was definitely no produce to buy! Just after lunch we decided to admit defeat and return to Brisbane centre to see if we could find some fresh food for supper. Getting out was no mean feat – it was achieved the bus back found and we left the Ekka behind not sure what we had made of the experience! Back in ‘centre vile’ we found Woolworths with its food hall and put together a meal to make in our accommodation which had cooking facilities. It all worked well – by 8.30 we were ready for bed, not quite sure what we had made of the Ekka but satisfied that we had made the most of our time in Brisbane and enjoyed our first taste of Australia! We had booked a cab for 6.30. It was still quite dark when clambered aboard to be driven to the airport by taxi driver from Stockport! Not a happy soul, he took delight in telling us of the number of sharks in the river and how he used to swim across in his younger day. We had been told it would take 3/4 hour to travel to the airport. In 20 minutes we were there and in 40 we were checked in, security checked and through to the departure lounge! We were amazed to find that our flight to Darwin was nearly 4 hours long – long enough to get to Rome or Marrakesh from home! It just underlined the distance issue that we just have not yet got to grips with. The flight was uneventful except that when we got on there was the smell of food that was quite delicious to two people who had eaten no breakfast! We were therefore somewhat crestfallen to find that everyone around us was given food and we were left out – on enquiry we found that the food had to be pre ordered. At no time in our booking or checking in process had ŵe been asked about breakfast. With no opportunity to buy anything we were left feeling a bit like ‘ Billy no mates’ and hungry! The first impression of Darwin was the heat as we left the ‘plane- it was like a thick blanket! In the four hours the temperature had mo end up 10 – 15 degrees! A very hot sun shone from a very blue sky! It was lovely. We had booked our accommodation to ensure ease of access to the Ghan station, this had placed us slightly out of town, but an enquiry provided detail of the bus route, so after a short siesta we were on the bus stop into town. We went from the bus station down to the water front. It was amazing. Very modern with bars overlooking a lido type swimming area. The sun shone down and we had a drink and weighed up the outer walk way going out to see. Reading material around the decking described the bombing of Darwin harbour – the area we were walking on. Apparently the Japanese bombed Darwin harbour shortly after Pearl Harbour and dropped more bombs. We felt very ignorant – we had no idea. The bombing wiped out all communication by taking out the post office which was on the site of the current North DarwinGovernment house further along the coast. The walk around to the harbour wall brought us to an area of tables laid out in front a number of food stalls selling everything from fish and chips to steak grills and Indian cuisine. There was a take away drink shop where they sold special beers and all sorts of things to drink. People sat out on the water front with their chosen eating. Gulls an black kites zoomed into eat the chips that people threw out over the water and the birds caught the titbits mid flight! We sat and downed a couple of beers while we waited to meet up with Jo Wightman, Tony Wightman’s daughter. We sat and watched the light as sun went down. At 7.00 we moved inland to meet with Jo. It was great to see her. Jo is really excited and committed to Darwin. She has been there for some time working now in a retail outlet. She admitted that she had not experienced the wet season. This could change her view I understand but at the moment she could not be more excited an out her life in Australia. It was great to see her so enthusiastic and happy. We were touched that she wanted to spend time with us and had given up her evening, but it was great fun to spend time with her. We were a bit undecided how to spend our second and last day in Darwin. In the end we decided to go back to town as regrettably we had no transport to get us to the national parks. On the bus route into town we me a man who was keen to share his knowledge of the area with us. As it happened his knowledge was extremely helpful. On his advice we went to the Governors House and lo and behold within minutes we found a large portrait of our friend Helen’s father. There he was. Bern Kilgariff. He was the first speaker of the Northern Territory and obviously very well thought of. I knew from Helen that her father was a politician and although the Helen 10 brothers and sisters, her father was never at home. We now know why! We were so excited to know someone who appeared in Government House. It was an interesting visit. Next up we took an amphibious bus trip of the highlights of Darwin and then took to the sea to look back on to the Darwin coast line. An interesting trip. Back on terra firms we found a gallery of aboriginal art which we loved. A small purchase was made – but it was so difficult to choose. We just loved the art. All of the prices had the name and background of the artist attached to the piece. Some of them were wonderful – but far too large for our house!! We ate dinner on the farthest point of the sea front. For me an excellent steak with prawns – ‘beef and rife’ – the only way to eat less than a 700 gram steak! Keith had the fish. The sun set over the water as we ate. It was lovely. We just loved Darwin and went home after a beautiful couple of days. Another sunny day dawned and we were off to the Ghan, the amazing train route across the desert to the south. We arrived at the Berrimah Road Goods Yard to some confusion. Unexpected confusion. People were milling. The baggage check in was not manned. Nor was the information desk – but within half an hour smiley people had appeared and we were sorted, large luggage stowed and heading for car J. We found our cabin and met Martin our ‘ Car Attendant’ – and we had arrived! The train left dead on time at 10.00 am. It eased out of Berrimah Goods Yard passing the detritus of years of train activity – old freight cars, mysterious pumps, gadgets and levers. All lay gathering rust in the sun. Between the tracks whiskers of grass gradually became clumps and then trees appeared and we wee out on the vast area of the ‘outback’. And it is vast! For the next 5 hours we rattled through a. landscape far more verdant than we had expected, but very empty. There was no evidence of wildlife – not even a bird. Just the hot sun pouring down on the passing landscape. It certainly was not desert as we know it. But it was flat – for miles and miles to the horizon – it was flat. However, life on the Ghan was not boring or monotonous. The train has a life and timetable of its own. At 11.30 we were called to lunch. A little early you might say – but as we had not had breakfast – eating could not come too soon! We headed as instructed to the ‘lounge’ where the others in our group of carriages (there were 30 carriages in the whole train and four to a dining car) had gathered prior to being called to lunch. The assembly comprised mainly of the 60 plus silver haired variety of human and were mainly Australian although it became clear from the accents heard over the period of the journey that in fact there were a number of nationalities represented, but these were mainly from within the younger contingent. There were also family groups, often of three generations. 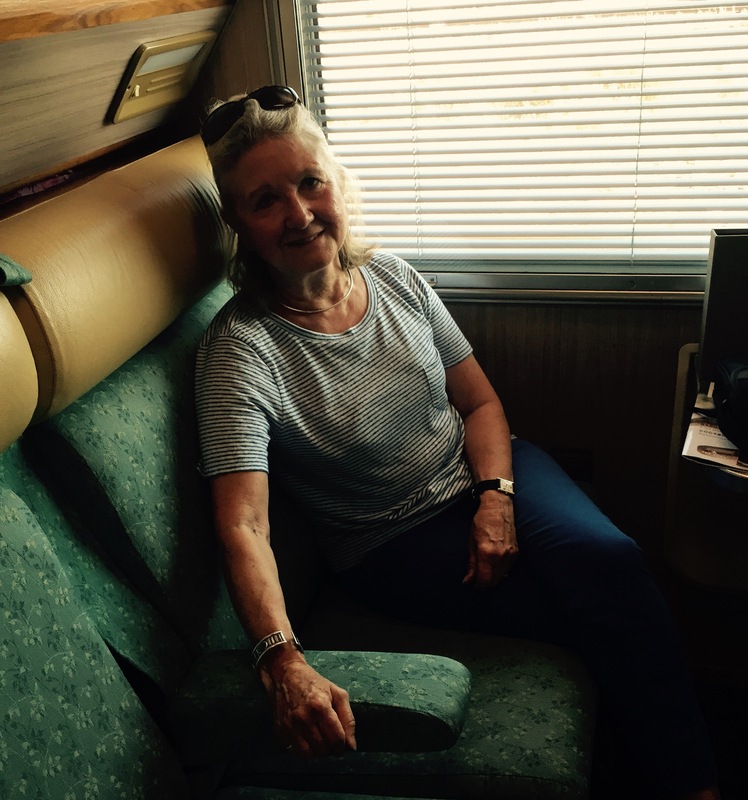 We teamed up with a lively couple from Brisbane for lunch who were getting to the end of a three week holiday that had included driving vast tracks of the north west Australia and the Ghan to Adelaide was their last leg. We shared an excellent lunch. Three small courses with wine efficiently and skilfully served with not a drop spilled. Very impressive! After lunch we adjourned to the lounge and chatted our way through the afternoon until at about 2.30 when we were told we were reaching the town of Katherine. Here we were given the choice of several free excursions. 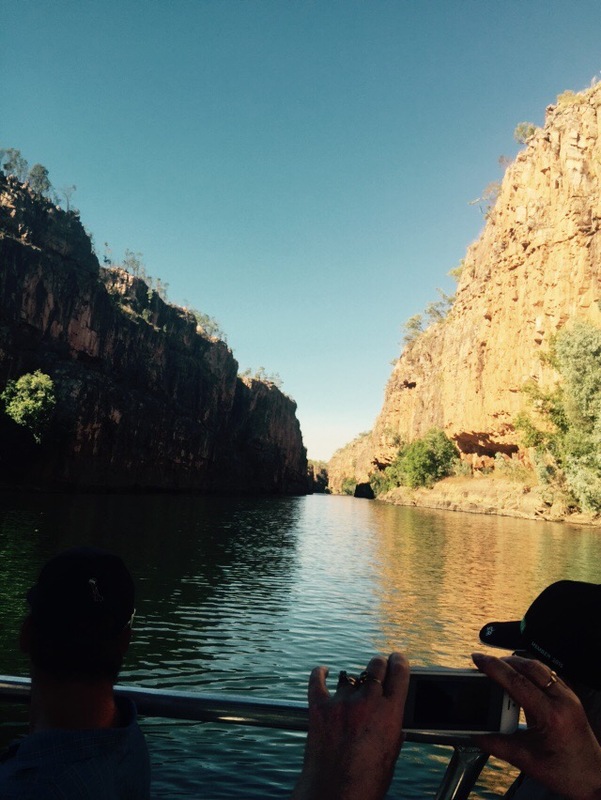 We opted for the Nitmiluk Gorge. This proved to be a lovely cruise down the oldest sandstone gorge in Australia. The cliffs are reckoned to be 900 m thick and the twisting river makes several 90 degree turns as it meanders its way along the gorge. Because of the lack of water (it is currently reckoned to be at least 10 m lower than the average height of the river) at one section we had to get off one boat and walk over the rocks before getting on another to make the final section of the journey. The cliffs soared a rich reddish brown over our heads over 70 m high. 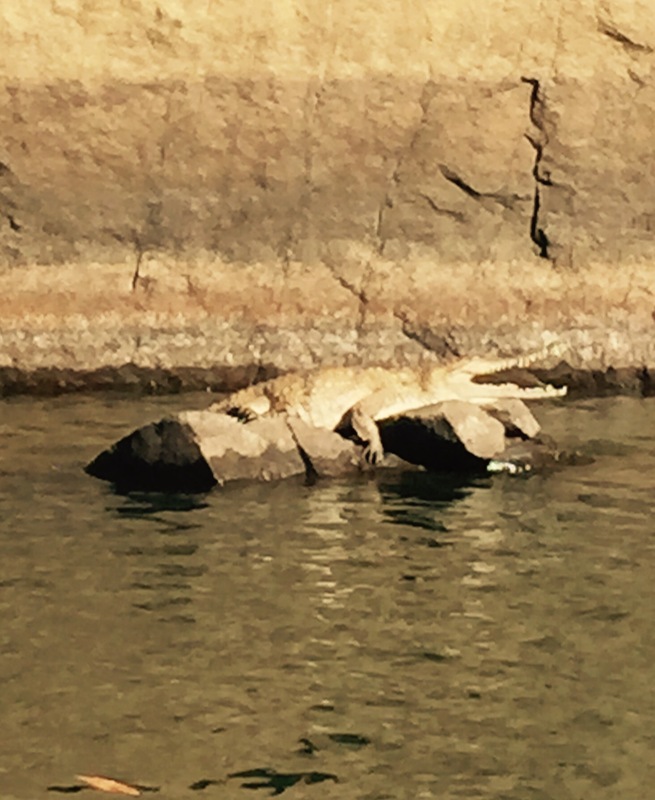 We saw our first crocodiles along the way, small pointy nosed creatures basking in the sunshine – quite detached from the pleasure boats passing by. 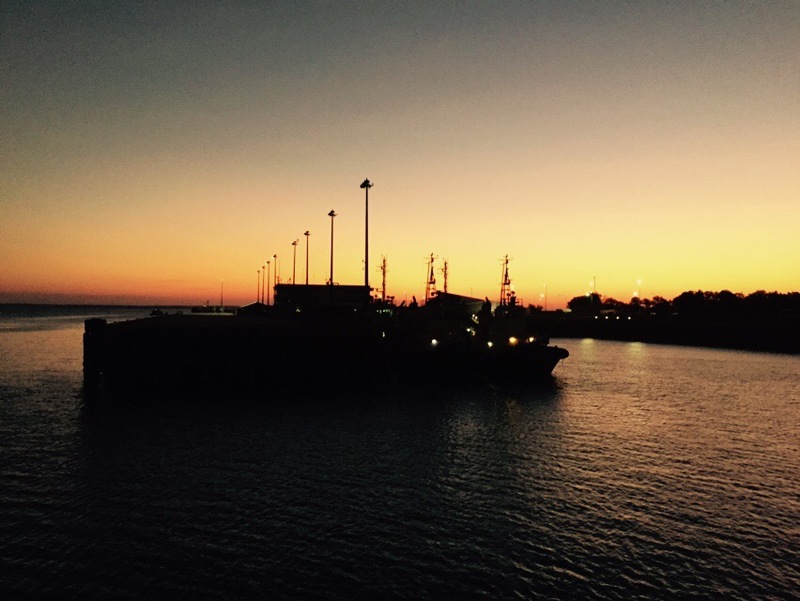 We eventually returned to our embarkation point and were whisked back in our tour buses to the Ghan, which had sat at Katherine station, patiently waiting our return. We clambered aboard and were soon on our way again. A shower in our minute but very space efficient en suite bathroom and we were ready for dinner. Accepting a later dinner time had earned Keith an exciting ‘lucky bag’ of goodies when we eventually reached the lounge again prior to an excellent dinner. Very exciting! We opted for the kangaroo steak with a slice of crocodile sausage. It felt a bit high risk but proved to be very tasty. We had joined up with Jenny and Peter again for our meal and had a very pleasant time. Amusingly when we emerged from the dining car, everyone had gone to bed. After a whiskey nightcap – the only thing we had payed for the whole day – we adjourned to bed almost turning out the lights as we went. It was 9.45! Arriving at our room we found beds had emerged from the walls of our cabin and we adjourned to sleep after a very interesting day. Alice Springs tomorrow!